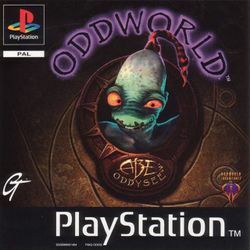 Oddworld: Abe's Oddysee was released on the PlayStation and Windows. The game was intended for "no menus, no inventory bars, no scorekeeping; just infinite lives, victims to rescue, and inexplicably challenging gameplay" and it delivers just that. This guide will present you with a walkthrough that guides you to get every Mudokon. If you just want to beat the game, and possibly kill some Mudokons for fun along the way, then use the speed walkthrough with minimal tips and spoilers. The Glukkons control the horrid rupture farms. The game is set in an entirely different world, completely odd from ours. 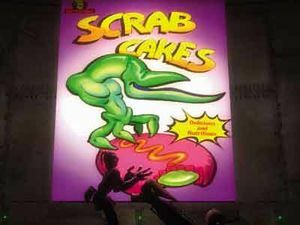 Abe, like nearly all Mudokons, works for Rupture Farms, which, among other things, manufactures Scrab Cakes. Unlike nearly all Mudokons, though, Abe is always blue. He isn't necessarily happy about being a slave, but gets by in life. Then, he learns that Mudokons will soon be used as the next snack produced by Rupture Farms. Abe decides to escape and will help others escape along the way. Unbeknownst to Abe, he is actually a part of a very important destiny. Will he fulfill his promises and save all 99 Mudokons, or will he be selfish? Really, it's up to you; they are both entertaining. This page was last edited on 16 August 2016, at 17:37.